Fidget spinners, in case you don’t know, are handheld toys that you can flick or twirl with your fingers – and have become the biggest things to hit the playground since last years’ bottle-flipping craze, with sales running into the millions. Why? A large part of the toy’s appeal it’s compact size. It can be easily be stuffed into a pocket or bag and then fetched out and played with just about anywhere. Another is the huge range of designs on offer, with prices ranging from just a few pounds to several hundred. Social media is awash with owners performing all kinds of nifty tricks with them too – and makers claim that fidget spinners can help you focus, while also reducing anxiety, in much the same way that fiddling with a pen or stress ball does. We've explained what a fidget spinner is below (in case you don't know), as well as shown you the latest fidget spinner prices. It's easy to pick up a cheap fidget spinner, so read on! Where can I buy cheap fidget spinners? It’s a palm-sized device, a bit like a tiny rimless wheel, with arms (or spokes) that radiate out from a central hub containing metal or ceramic bearings. Since each arm has a weight at the end, flicking or spinning the gadget can keep it twirling for minutes at a time. Some devices also come with additional hubs at the end of each arm giving you additional ways to play – or may contain LED lights or even miniature speakers that you can pair with your smartphone over Bluetooth. Fidget spinners are usually made from 3D printed plastic or metals such as brass, titanium or stainless steel and come in a huge range of colours and designs. The best devices are well-balanced and are free from oscillation (so they spin smoothly and evenly) and they should also be quiet – the last thing you need when you’re playing is a noisy bearing that annoys either you or the people around you. You should also look for a device that has some heft to it since this helps the spinner keep spinning for longer – manufacturers often quote spin times alongside the product’s blurb, although real world figures can vary wildly. If Ancient Romans had fidget spinners, this is exactly the kind of design they would plump for. Available in brass, bronze, silver and rose gold, the all-metal Dual Caesar Crusader boasts an antique look that includes both a shield motif on each of its twin rotating arms, and a tiger's head on its indented finger grip. Luckily its robust design is matched by the spinner itself, which feels weighty in the hand. 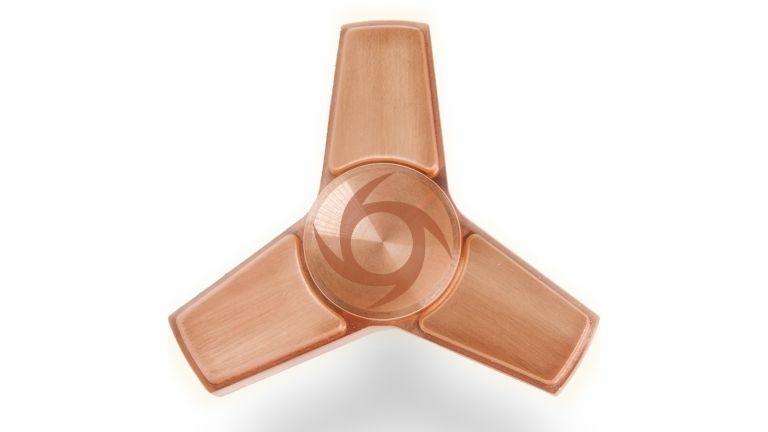 It also uses low-friction technology with quality metal bearings that should ensure it spins longer, and is longer-lasting, than some other fidget spinner designs. The polar opposite of the Dual Caesar Crusader in terms of look, feel and price, the Infinity Spinner i5 Pro is a quality item – as you would expect given its cost. Available in three different colours, it boasts a tri-spinner (three blade) construction with an all-metal body and a ceramic bearing for virtually silent operation and long life. It feels suitably hefty in the hand and has a long spin time, averaging around five minutes between each deft flick of a finger. The indented finger grip also makes it easy – and comfortable– to hold. The only thing we don't like about the Infinity Spinner i5 Pro is that the squared-off design of its tri-spinner blades can feel a little sharp. There's also that price tag, of course, but as premium quality, time-wasting toys go, this gadget is definitely one of the best. Great for fidgety hands, and as a stress-reliever, this 7.5cm small and easy-to-carry spinner is very fast and stable for the proce thanks to a specially-designed ball centre bearing.